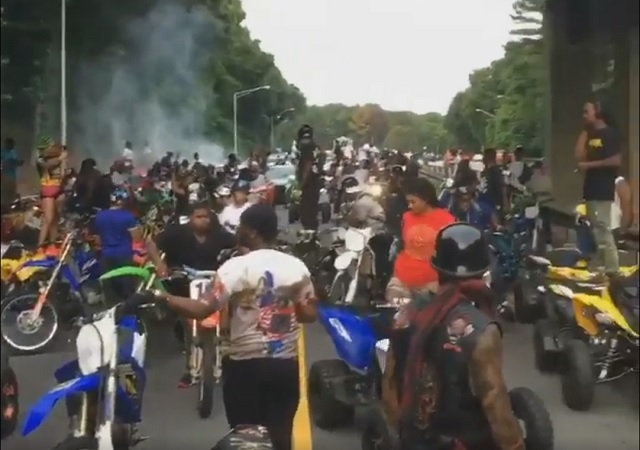 Viral video out of Atlanta shows hundreds of members of an Atlanta biker gang clog up the streets, ignore red lights, and drive on sidewalks with ATVs and motorbikes, creating a stunning scene of lawlessness. Upright citizens are forced to sit around waiting for at least three solid minutes as the giant motorcade passes. The gang members are part of a group called "#ATLBikeLife." Video uploaded to Twitter appears to show the criminal thugs stopped traffic on a highway just for the hell of it. Police claimed they were going to crackdown on the group last week. They've been saying that for years now, yet it appears this is the biggest the motorcade has ever been.